Great little getaway on quality lake frontage, near boat launch. Great fishing! Great up-north getaway steps from the water! 3BR, sleeps 8, perfect for groups! East Battle Lake gem! Cute, comfortable, no-frills cabin just steps to the beach. You can't get any closer to the water! Hard, sandy bottom is perfect for swimming. You will love this quiet, yet larger lake. Great for water sports and fishing. East Battle Lake is a spectacular fishing lake so bring your boat - it's conveniently located just down the road from the public boat launch. Easily take your boat in and out without the hassle of driving miles to the boat launch. East Battle is a clear lake measuring 1949 acres, 87 feet max depth with plenty of bluegill, bass, northern and walleye. Your group will enjoy the large, level lot perfect for volley ball, badmitton, lawn games and plenty of room for the kids to play. It's located on a quiet, low traffic road. 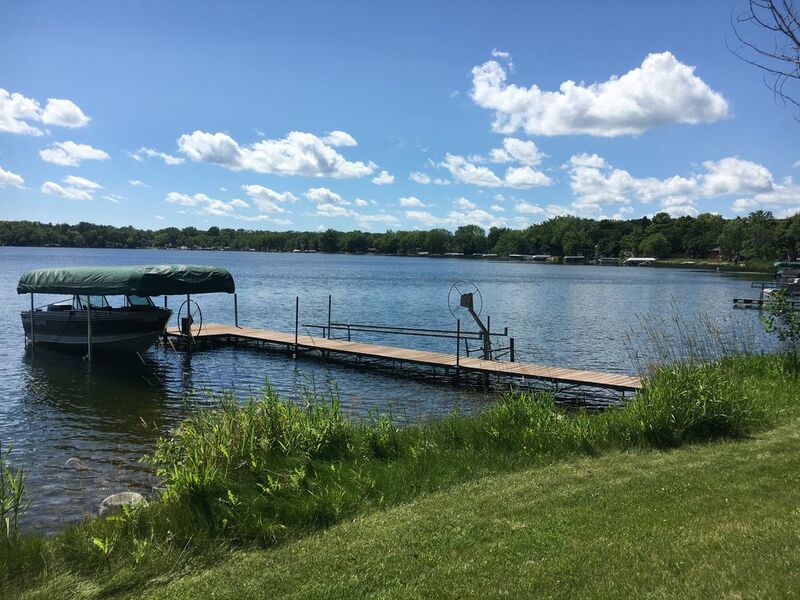 Nearby Henning, Battle Lake and Otter Tail offers plenty of dining choices, three golf courses, horse back riding and more. Bike the Glendolaugh State Park, see Phelps Mill, go tubing down the Otter Tail River, go berry picking, hike to the top of Inspiration Peak or enjoy many of the area's festivals and art fairs. Sleeping accommodations include: BR1-Queen, BR2-Two Twins, BR3-Full, plus 2 twin mattresses to set up where you choose. Linens provided. Laundry on-site. Jenny Hilton, is the property manager and a REALTOR /Broker with Paulson Land Co of Battle Lake. "I love cabin life and want everyone to have the opportunity to experience amazing sunsets, the thrill of catching that monster walleye and lazy days on the dock." It's perfect because it's a little rustic with all the amenities you need for a great family vacation! Quiet lake without a lot of boat traffic. Peaceful. I love it! It's near the boat launch so you can take your boat out easily if needed. Sandy bottom is perfect for swimming. Big yard for volley ball, badmitton, lawn games and room for the kids to play. Full Bathroom on upper level. Large yard for lawn games, tents, etc. Rigt up next to the water. Owners prefer 7 night rentals. Shorter stays are available at $324 per night with 3 night minimum.